Weather Report: Low 38, High 46. It was warmest when I started hiking, then the drizzle started and the temperature hovered between 38 and 43 for the entire hike. 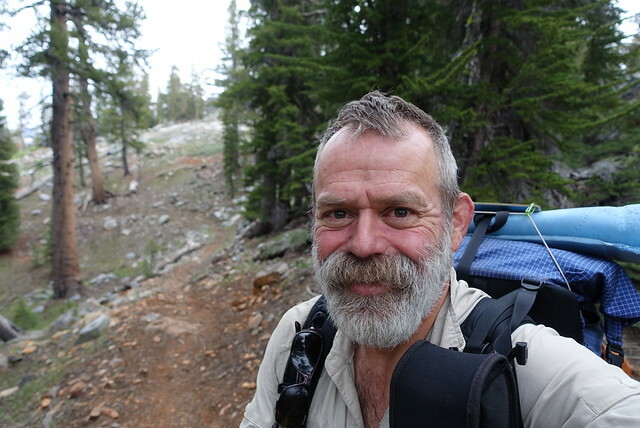 Today I was meeting Dave at Sonora Pass at 3:30, and I did not want to be late. I left camp after downing two cups of coffee, and started down the trail pretty much at mile 1000, woo! After I passed mile 1000, the trail suddenly took a very different character. 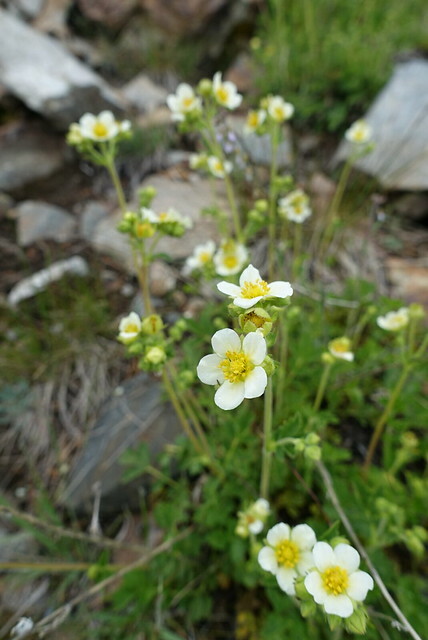 The terrain had changed from granite boulders and rock to soft volcanic-looking soils, and the trail track was suddenly fast, with no boulders or water bars or icky mud to step around for many miles. 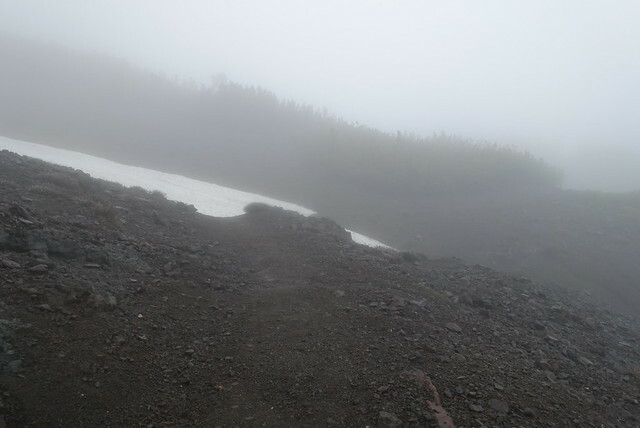 Around the sixth mile (mile 1006), the trail broke away from the creek and began a steady uphill climb, up and up... and the drizzle started as well. I knew by looking at the map that the trail wound its way up to 10,800', and if it was drizzling at the campsite at 9600' it might well be snowing up above. But the odd thing was that it was very warm overnight, only getting down to 46 even at the 9600 feet elevation I was camping at. That tells me that it wouldn't be snowing, that this weather was likely subtropical in origin, and would pass soon enough. It's also not the type of weather that induces thunderstorms, so I decided to just keep going. It wasn't so much a "well, I'll risk it" decision as much as it was a "well, I'll do it until I can't do it anymore, then I'll turn around". I did not have to turn around. But at mile 1007, the infrequent drips from the sky became a more steady drizzle, so I put on the rain jacket and the waterproof glove shells, put my REI sheer silk baseleyer leggings and midweight baselayer shirt on. I also decided to try on the rain kilt over my hiking pants to see how the whole getup would work. It worked fantastic, the upper part of my pants and crotchal region stayed dry the whole hike, no chafing or rubbing of wet fabric on private parts. I'll be doing that same thing later in this trip. From mile 1007 it's just ten miles to Sonora Pass, but the PCT goes up very high along a ridge and stays up there until nearly the very end. The first few miles were super-easy: clear of snow, a constant steady uphill grade, wide trail that was wide enough to drive a Jeep down. 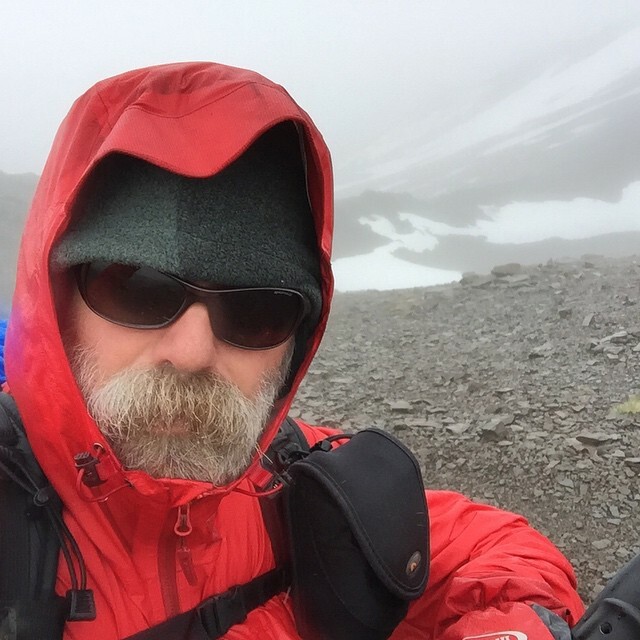 Then the trail meandered along a ridge, and after five miles came to a large snowfield at the top of the ridge, misty and atmospheric... and with cell phone coverage, so I stnapped a selfie and texted Dave that I'd be there on time. 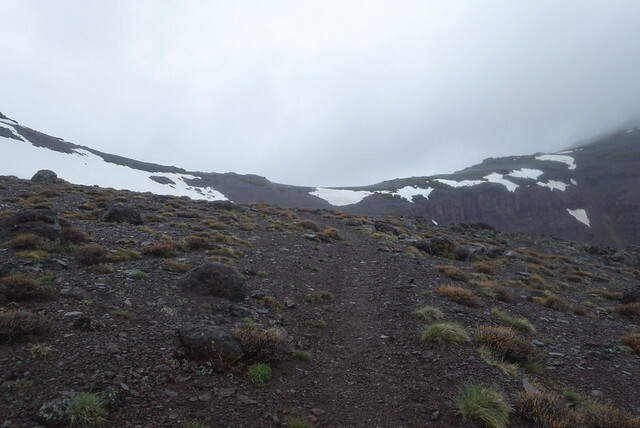 That was a bit presumputious of me, from mile 1012 to 1017 the trail went across more snow than not as it danced along the ridge spurs, all sharp and volcanic looking and covered with snow. 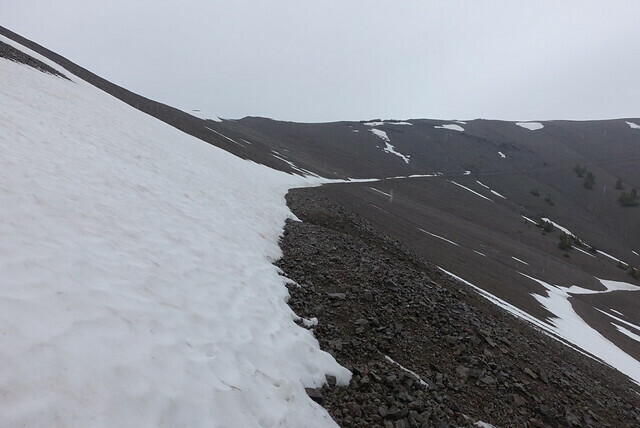 I walked around some snow fields, I glissaded down others, I consulted the GPS for the track now and then. It was good fun, and I was pleased that I could handle myself on the snow. It was cool to cold, but I was warm with my clothing, though I wished my feet were drier--they were pretty sopping wet. I thought "you know if I could do this, the north Cascades won't be a problem--this is Northwest weather!" I made it to Sonora Pass at 3:40... oops, I was ten minutes late... and in the last few miles, I had decided I didn't want to camp tonight. I have no dry socks or clothes, my tent is wet, I'm just tired of being soggy. I asked Dave if we could get me to a motel in Bridgeport, and he said "well, sure, but just come back with me to Tahoe." That really sounded great, so I took him up on the offer, and by 6pm I was in his dry and warm house and all those soggy socks were in the wash, along with the rest of my stinky clothes. Dave said they smelled like something about me was fermenting, and I believed him. 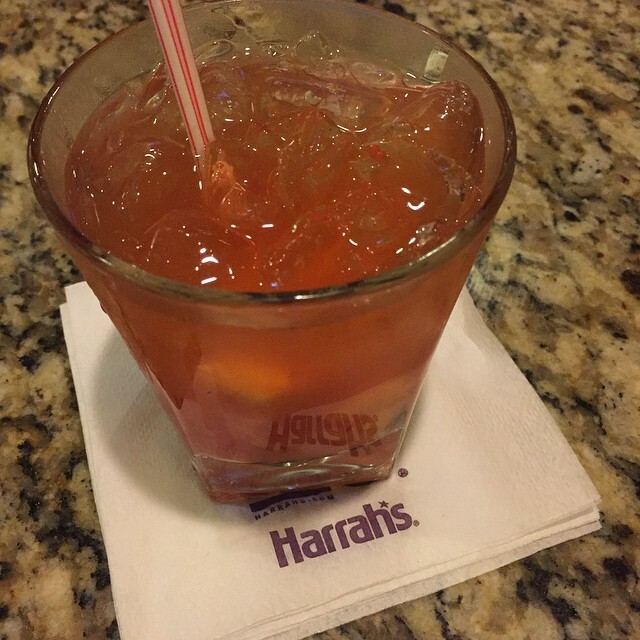 Dinner was next, and we went over to the Harrah's buffet, but it was closed, so we ate at a restaurant bar at Montblue and chatted up the bartender. Lots of discussion about Burning Man projects; it was a good time. The food was quite good as well--I had lobster bisque and roasted grilled salmon and chocolate lava cake, which I couldn't finish! Definitely not a camp dinner. Tomorrow I'll get back on the trail; Dave's offered to take me back. The weather should be nicer, and I'll certainly be looking forward to not hiking in the drizzly rain. I wonder if I'll see anyone else too: today I didn't run into any other hikers on the trail. Maybe they were waiting out the storm; we'll see!